They say three is a charm. But for American DJ, three is a jewel – a Jelly Jewel! The company has released the third in its Jelly Series of DJ/club two-in-one LED moonflower effects with transparent cases – and, as its name suggests, the Jelly Jewel is a real gem. Like the other two effects in the Jelly Series (Jellyfish and Jellydome), the Jelly Jewel is the perfect double play for any DJ or mobile entertainer, because there are two visual experiences going on at once. First, the effect creates a visually stunning array of color-changing LED moonflower beams. The Jelly Jewel produces 46 bright red, green, blue and white (RGBW) beams that can be projected onto walls, ceilings or dance floors, as they move to the beat of the music. Second, the glowing transparent case is part of the show. As the RGBW beams shine through it, the case itself appears to change colors. Unlike most lighting effects that DJs want to disguise or hide away from party goes, this glowing dome, when displayed out in the open, will “wow” any crowd and provide a great conversation piece at any entertainment venue. 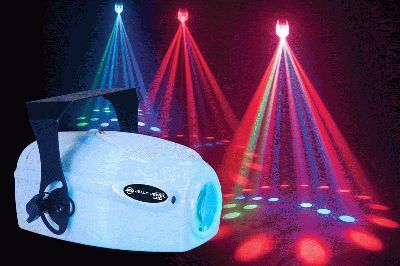 Using Jelly Jewel couldn’t be easier for a DJ or mobile entertainer. Just plug in the sound-activated effect and it will move to the beat of the music via exciting built-in programs. Its compact size makes it a great mobile traveler. Weighing in at just 4 lbs./ 2 kg., it’s much lighter than even a typical bag of groceries. Portability is made even simpler with its 10.25”Lx9”Wx6”H/ 260 x 230 142 mm miniscule frame. The moonflower effect was named “jewel” because even in the off position, party goers are sure to think it resembles a spectacular bejeweled dome. But there’s a second reason for the name: “Jewel” was the name of one of American DJ’s earliest sound-activated moonflower effects back about 20 years ago. Jelly Jewel is a reminder of those earlier effects. But this effect packs even more punch with all of the modern amenities, including LED lighting. One of the big advantages of LEDs is their long operating life. The Jelly Jewel’s 16 red, 10 green, 10 blue and 10 white LEDs boast a 50,000 hour rating. Add to this the fact that the unit has no moving parts, and DJs and entertainers can rest assured that the Jelly Jewel will provide years of reliable operation with no maintenance concerns. LEDs also operate at a very cool temperature -- so while the dance floor may be hot, the Jelly Jewel never will be. Packing up this DJ dynamo is also a cinch, as there’s no waiting time needed for a cool-down to take place. Additionally, LEDs consume very little energy; the Jelly Jewel draws a maximum of 10W, so it will help venues save on electricity costs. It will also help DJs and mobile entertainers save on their lighting budgets. The MSRP of the Jelly Jewel is just $119.95. It is made even more precious with its one-year limited warranty. For those who want to protect this “precious” investment, the Arriba Cases model AC-130 is ideal for keeping the Jelly Jewel damage-free during transport and clean and dust-free while in storage.